We proudly introduce the Microgaming’s new game for February 2017, Secret Romance. The slot ties in well with the month of love as it explores romance and passion. Secret Romance is a 5×3 reel slot with 15 paylines in the base game, and it contains other exciting features that can be played on multiple platforms. You can play with a minimum of 0,15 coins for wins up to 90,000 coins! During the base game you will come across Mystery Symbols that can transform into any symbol (except the wild symbol) in the base game, while in the Free Spins feature, the Mystery Symbol can turn into wild symbols! All the mystery symbols, will appear as a closed red envelope, and can transform into a full screen of 15 scatters! How amazing is that? The mystery symbols are stacked in the base game and super stacked in the Free Spins feature. When you land 3 or more scatter symbols within the base game, you will earn yourself 14 Free Spins. The feature will include Super Stacked Mystery Symbols which will be stacked up to 20 symbols high and will appear on all reels. Each time 3 or more scatter symbols land on any reel, the Free Spins win be increased by one level of up to a maximum of 5x. All bets played will be the same as the game that triggered the Free Spins feature. When you land 3 or more scatters on a reel, you will earn yourself 14 Free Spins. Remember, the scatter symbol wins will multiply by the total bet staked and scatters do not contribute to Paytable Achievements. Wild symbols are also included in the game, which will substitute any symbol except the scatter symbol. Slot rules apply for Secret Romance, in that all wins will be awarded from left to right adjacent symbol combinations on a valid payline. Scatter symbols are an exception as they pay in any line. All wins will be multiplied by the bet placed per line except for the scatter symbols, and only the highest winning combination on a reel will award per symbol combination. 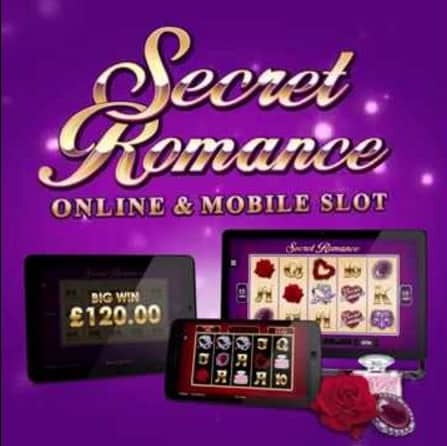 Flirt with fortune and play Secret Romance slot at any of Microgaming Casino from our website. Who knows, may be it will be the lucky winner smiling all the way to the bank? Here is a small suggestion: choose the casino with free spins bonus since it will give some extra excitement. For example, Euro Palace – 100 free spins, Platinum Play – 50 free spins, and Wintingo – 50 free spins!